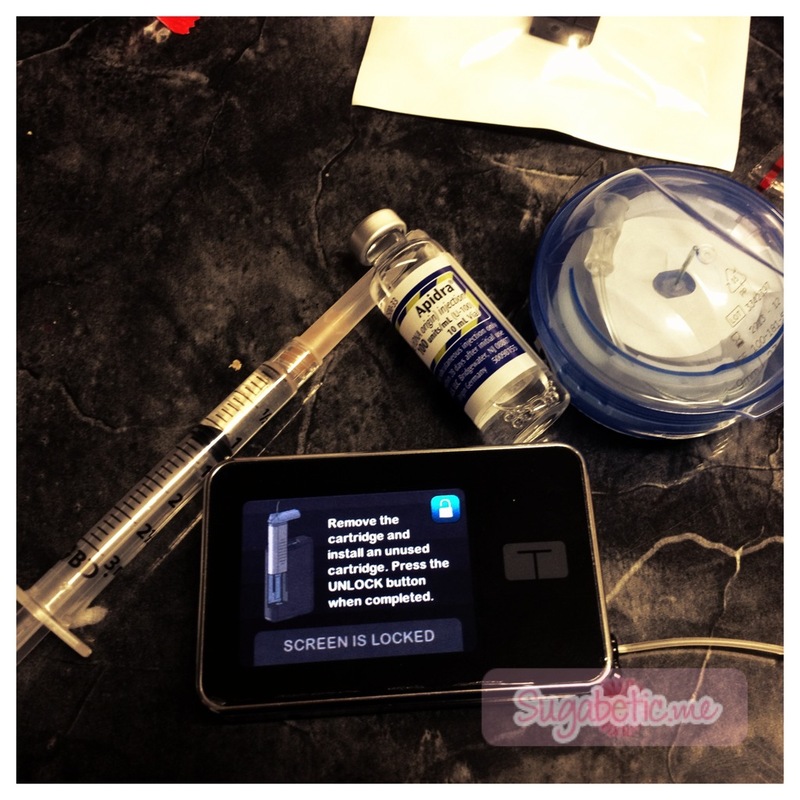 When I switched over to the Tandem t:slim insulin pump, I knew I would have to switch insulin as well from Apidra back to Novolog, which was fine with me. I had used Novolog successfully during my pregnancy with a bit of extra work. So, I started t:slimmin’ with Novolog and things worked out great. I did it anyway. And I have been for the past month. I don’t know why I’m able to use Apidra and others aren’t, but I’ve been working on a theory…. One thought is that the heat from charging the t:Slim damages the Apidra since it’s not stable in heat. I have been charging my t:slim about twice per week, and when I do, I place it on a refrigerated (NOT frozen!) cool pack for the time that it takes to charge. Whether this is the “cure” for it or not, I don’t know, but I’ve been successfully using Apidra for the past month with no issues. Another theory I have is geographic location… or sea level…or atmospheric pressure…. maybe that’s what I’m thinking… I don’t know.. I’m not a scientist (though I would LOVE to be one) but something else has got to be happening for others to have such an issue and not having success with Apidra in the t:slim. I really hope this can be figured out. I think the t:slim is a great insulin pump and could be used by a lot of people (well, a lot MORE people) if Apidra was a good, stable option. What’s the point of this post? I’m not quite sure. Other than to be another testament to just how much of a diabetes geek I am. In most pumps available on the market now, you can set up basal rate profiles that control simply the basal rate – nothing else. As I have learned over the past several years of trying to get better control, more than just basal rates need to be changed for other things. Such as a woman’s menstrual cycle, or people who exercise maybe only a couple days per week and randomly instead of an avid daily exerciser or at least consistent. Or, if you’re like me, you have different adsorption rates for different areas. Lately, it has been the latter to make the difference for me. It seems my basal rate tests are good if I have my site in my leg or arm, but if I place a site in my abdomen area, I bottom out… a LOT. And this is no surprise. I have heard many reasons for this happening such as 1) the infusion site is closer to where the actual pancreas is, so the body knows to look for it there, 2) other sites tend to have more fatty tissue and less nerve endings causing the insulin to not be absorbed as well , and a few others. All I know is that I do have a big difference. It’s even been researched by the Department of Medicine at the University of Minnesota. And this is one of the biggest reasons why I love the Tandem t:slim pump. You don’t just set a profile for basal rates…. it’s a personal profile… meant to fit you… in every aspect of your insulin delivery needs. Let’s just say you’re more sensitive to insulin in your abdomen… wouldn’t you need a different insulin-to-carb ratio and correction factor as well? In the t:Slim, you can actually set those different rates for different times per day, and set your profiles as needed. So, since I see such a difference between my tummy and thigh sites, I have now created a profile for each so that I can switch to which ever one I need after I change my cartridge and site. All I have to do is tap Options, My Pump, and Personal Profiles, then select the one I need, and select activate… 5 taps and everything is completely set up for me. I love that Tandem has been this innovative. Are they a perfect company? Nope. None are. Is this a perfect pump? Nope, and none of them are either. It’s all about what fits you best. And for me, having the Personal Profiles, makes the t:slim fit me better than any of the others available right now.